Hello (and Thank You), World! What started out as a simple conversation in my head quickly became a string of feverish, lengthy text messages to some of my best girlfriends — and then eventually, the tiniest glimmer of a dream. What if I could teach young women how to tell stories with their cameras? After some manic brainstorming, Girls in Focus had a name. Almost simultaneously, the logo presented itself as clear as day: a girl in braids, hiding behind a camera. The graphic designer took the idea and ran with it. She came up with the upturned, Pippi Longstocking-esque braids, the wink, and the handwritten font. It was exactly right — and somehow that made it seem so real. We had a name! And a logo! 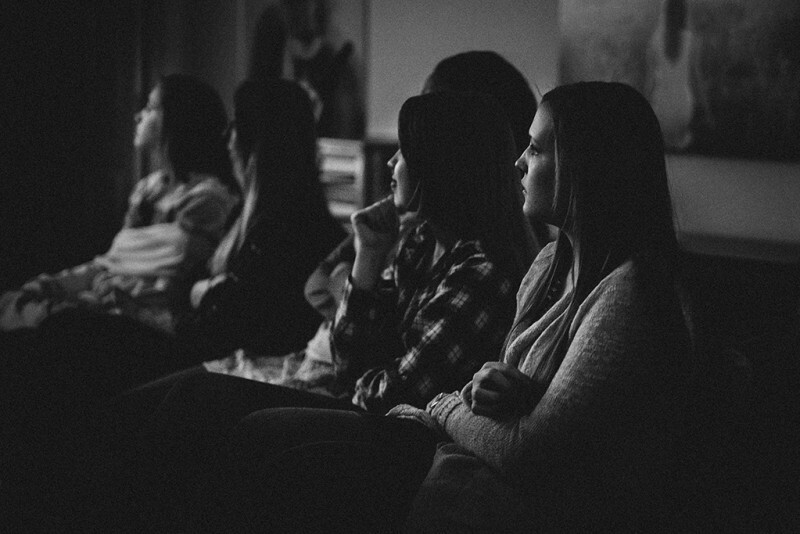 Before I really even understood what Girls in Focus was, it was already being shaped and fed and encouraged by other girls and women of many ages, races, nationalities, and backgrounds. I have many harebrained ideas, but this didn’t feel like one of those. It didn’t seem even remotely absurd. It seemed essential and urgently needed. For one thing, I was tired of talking about feminism. I wanted to DO feminism. Furthermore, I was tired of listening to the constant and conflicting chatter on the airwaves about what it means to be female. Indeed, Girls in Focus started out as an attempt to teach young women to think beyond their physical beauty, but most importantly, Girls in Focus was born out of a love for stories — stories of all kinds. And I wanted to enable and empower young women (and perhaps myself) to add more color and more dimension to the stories we tell about ourselves. If we are to ever understand the importance of women in the world, women need to tell their stories — and we need the encouragement and the tools to do so. I had BIG dreams. Big goals. Daunting, even. Dreams, as it turns out, are a TON of work. Before I could even think about designing a curriculum or waxing philosophical with young minds about the importance of documentary photography, I had to get this thing off the ground. I spent many, many late hours wrestling with WordPress and learning to customize the website. I gave a Pecha Kucha talk in Springfield and tried not to cry or throw up on stage. (Success!) I talked to reporters and sent out press releases. I made a video with a group of middle school girls. In November, we created a crowdfunding campaign via Start Some Good. I begged for money and used camera equipment on every kind of social media I have access to. I started a Twitter! I tweeted! At first, the donations slowly trickled in. It was both thrilling and nauseating. If I didn’t reach my goal, how on earth was I going to afford 10 cameras, memory cards, textbooks, prints, coffee table books, promotional materials, ink cartridges, snacks, field trip funds, and gallery shows? Girls in Focus was still just a pipe dream, but it was becoming more and more real all the time. We simply had to succeed. The hard work and relentless nagging paid off. Much to my relief, delight, and surprise — and through the generosity of many, many people — we somehow raised $10,051 in 28 days. And with that, we were off and running. Immediately, I purchased 10 Sony A3000 cameras, memory cards, a few educational DVDs, and simple textbooks for each student. I also established an extensive library of photography books featuring a wide array of photographers so that we could refer to them in student discussions. Student applications started to pour in. We had more applications than we had cameras, but some of the applicants were able to provide their own cameras. In all, our inaugural class includes 13 students who range in ages from 13 to 18. I can honestly say that I look forward to Wednesday nights with my GIF students. Words are inadequate to describe what a tremendous privilege it is to be able to share my love of photography with these bright and curious young women. I intend to blog and share classroom updates as I am able. I hope you will follow along as we learn more about photography, ourselves, and one another. Girls in Focus aims to empower young women through hands-on workshops that teach the art and science of documentary photography. © 2014 Girls in Focus. All Rights Reserved.